Two Maui Bus buses engaged in paratransit services. One is picking up a person who uses a wheelchair, while another is discharging another person using a mobility scooter. Paratransit is recognized in North America as special transportation services for people with disabilities, often provided as a supplement to fixed-route bus and rail systems by public transit agencies. Paratransit services may vary considerably on the degree of flexibility they provide their customers. At their simplest they may consist of a taxi or small bus that will run along a more or less defined route and then stop to pick up or discharge passengers on request. At the other end of the spectrum—fully demand responsive transport—the most flexible paratransit systems offer on-demand call-up door-to-door service from any origin to any destination in a service area. In addition to public transit agencies, Paratransit services are operated by community groups or not-for-profit organizations, and for-profit private companies or operators. Typically, minibuses are used to provide paratransit service. Most paratransit vehicles are equipped with wheelchair lifts or ramps to facilitate access. In the United States, private transportation companies often provide paratransit service in cities and metropolitan areas under contract to local public transportation agencies. Transdev, First Transit and MV Transportation are among the largest private contractors of paratransit services in the United States and Canada. "Definition: any type of public transportation that is distinct from conventional transit, such as flexibly scheduled and routed services such as airport limousines, carpools, etc. 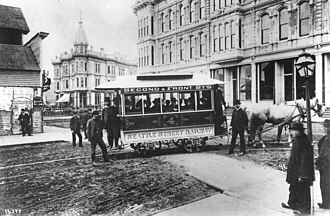 Etymology: para- 'alongside of' + transit" The use of "paratransit" ("para transit", "para-transit") has evolved and taken on two somewhat separate broad sets of meaning and application. The more general meaning involved projects starting in the early 1970s, documented by the Urban Institute in the 1974 book Para-transit: Neglected options for urban mobility, followed a year later by the first international overview, Paratransit: Survey of International Experience and Prospects. Robert Cervero's 1997 book, Paratransit in America: Redefining Mass Transportation, embraced this wider definition of paratransit, arguing that America's mass transit sector should enlarge to include micro-vehicles, minibuses, and shared-taxi services found in many developing cities. Paratransit, as an alternative mode of flexible passenger transportation that does not follow fixed routes or schedules, are common and often offer the only mechanized mobility options for the poor in many parts of the developing world. Since the early 1980s, particularly in North America, the term began to be used increasingly to describe the second meaning: special transport services for people with disabilities. In this respect, paratransit has become a subsector and business in its own right. The term paratransit is rarely used outside of North America. A NYC Transit paratransit bus. In 2013, the Canadian Urban Transit Association compared the eligibility requirements of paratransit services in Canada and the United States . Annually, the Canadian Urban Transit Association publishes a fact book providing statistics for all of the Ontario specialized public transit services as of 2015 there were 79 in operation . Before passage of the Americans with Disabilities Act of 1990 (ADA), paratransit was provided by not-for-profit human service agencies and public transit agencies in response to the requirements in Section 504 of the Rehabilitation Act of 1973. Section 504 prohibited the exclusion of the disabled from "any program or activity receiving federal financial assistance". In Title 49 Part 37 (49 CFR 37) of the Code of Federal Regulations, the Federal Transit Administration defined requirements for making buses accessible or providing complementary paratransit services within public transit service areas. Most transit agencies did not see fixed route accessibility as desirable and opted for a flexible system of small paratransit vehicles operating parallel to a system of larger, fixed-route buses. The expectation was that the paratransit services would not be heavily used, making a flexible system of small vehicles a less expensive alternative for accessibility than options with larger, fixed-route vehicles. This however ended up not being the case. Often paratransit services were being filled up to their capacity. In some cases, leaving individuals who were in need of the door to door service provided by paratransit unable to utilize it due to the fact that disabled people who could use fixed-route vehicles also found themselves using these paratransit services. With the passage of the ADA, Section 504 of the Rehabilitation Act was extended to include all activities of state and local government. Its provisions were not limited to programs receiving federal funds and applied to all public transit services, regardless of how the services were funded or managed. Title II of the ADA also more clearly defined a disabled person's right to equal participation in transit programs, and the provider's responsibility to make that participation possible. In revisions to Title 49 Part 37, the Federal Transit Administration defined the combined requirements of the ADA and the Rehabilitation Act for transit providers. These requirements included "complementary" paratransit to destinations within 3/4 mile of all fixed routes (49 CFR 37.131) and submission of a plan for complying with complementary paratransit service regulations (49 CFR 37.135). Paratransit service is an unfunded mandate. 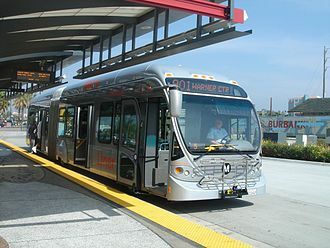 Under the ADA, complementary paratransit service is required for passengers who are 1) Unable to navigate the public bus system, 2) unable to get to a point from which they could access the public bus system, or 3) have a temporary need for these services because of injury or some type of limited duration cause of disability (49 CFR 37.123). Title 49 Part 37 details the eligibility rules along with requirements governing how the service must be provided and managed. In the United States, paratransit service is now highly regulated and closely monitored for compliance with standards set by the Federal Transit Administration (FTA). 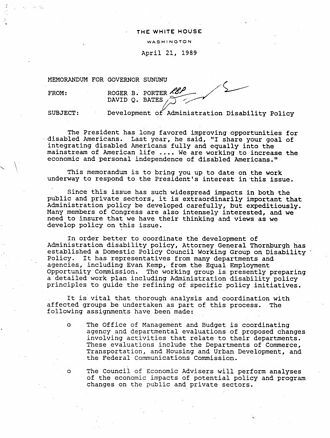 As the ADA became effective in 1992 (49 CFR 37.135), the FTA required transit systems in the United States to plan and begin implementing ADA compliant services, with full implementation by 1997 (49 CFR 37.139). During this period, paratransit demand and services rapidly expanded. This growth led to many new approaches to manage and provide these services. Computerized reservation, scheduling and dispatching for paratransit have also evolved substantially and are now arguably among the most sophisticated management systems available in the world of rubber tire transit (land-based non-rail public transit). Since the passage of the ADA, paratransit service has grown rapidly as a mode of public transit in the United States. Continued growth can be expected due to the aging of baby boomers and disabled Iraq War veterans. The growth of the number of people requiring paratransit has resulted in an increase in cost for the paratransit industry to maintain these services. The results of this rising cost are the paratransit industry trying to get individuals to move from a reliance on paratransit vehicles to fixed-route vehicles. Due to the push to have paratransit vehicles being the main method of transportation for disabled individuals prior to the passing of the ADA, the paratransit industry is finding it hard to get individuals to switch over to fixed route transportation. US Government Accountability Office GAO released a report in November 2012 for the Federal Transit Administration which "examined: (1) the extent of compliance with ADA paratransit requirements, (2) changes in ADA paratransit demand and costs since 2007, and (3) actions transit agencies are taking to help address changes in the demand for and costs of ADA paratransit service." The report found that "average number of annual ADA paratransit trips provided by a transit agency increased 7 percent from 2007 to 2010" and that the average cost of providing a paratransit trip is "an estimated three and a half times more expensive than the average cost of $8.15 to provide a fixed-route trip." . In response to increasing ridership and costs of providing paratransit service, WMATA made two significant changes beginning in 2010: the paratransit service area was reduced from jurisdictional boundaries to the ADA requirement of within a 3/4 mile corridor of fixed-route services; and, fares were linked to WMATA's fixed route services and charged to the ADA allowable maximum of two times the fastest equivalent bus or rail fare. These changes helped result in the first-ever reduction in the number of year-over-year trips between 2011 and 2012. The complicated nature of providing paratransit service in accordance with ADA guidelines led to the development of sophisticated software for the industry. Intelligent transportation systems technologies, primarily GPS, mobile data terminals, digital mobile radios, and cell phones, and scheduling, dispatching and call reservation software are now in use increasingly in North America and Europe. Interactive voice response systems and web-based initiatives are the next technology innovation anticipated for paratransit services. Advanced analytics is another field being applied to paratransit operations. Some companies are beginning to integrate cloud computing models to find operational efficiencies and cost savings for smaller paratransit service providers. There is no legislation providing details on paratransit standards, but the Canadian Urban Transit Association has provide voluntary guidelines for member transit agency to use to determine para transit needs and standards. TTC however offers the service. 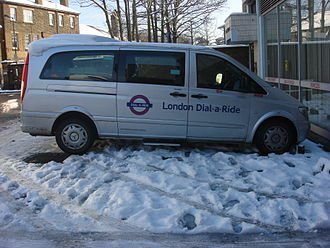 In the United Kingdom, services are called community transport and provided locally. The Community Transport Association  is a central organization recognized by the government which "promotes excellence through training, publications, advice, events and project support on voluntary, community and accessible transport." In Hong Kong, Rehabus service is provided by the Hong Kong Society for Rehabilitation. In Australia, Disability Standards for Accessible Public Transport under subsection 31 (1) of the Disability Discrimination Act of 1992 mandated that as of 2002 "all new public transport conveyances, premises and infrastructure must comply with the transport standards. Facilities already in operation at that time have between five and thirty years to comply with the standards." In some parts of the world, transportation services for the elderly and disabled are obtainable through Share Taxi options, often without formal government involvement. Paratransit systems in many developing world cities are operated by individuals and small business. The fragmented, intensely competitive nature of the industry makes government regulation and control much harder than traditional public transport. Government authorities have cited problems with unsafe vehicles and drivers as justifying efforts to regulate and "formalize" paratransit operations. However, these efforts have been limited by ignorance on the part of regulatory authorities and mistrust between authorities and operators. ^ Cervero, Robert (1997). Paratransit in America: Redefining Mass Transportation. Westport, Connecticut: Praeger Press. ISBN 9780275957254. ^ Cervero, Robert (2001). "Informal Transit: Learning from the Developing World". Access. 18: 15–22. Archived from the original on 2018-03-28. ^ "Specialized Transit Eligibility Certification Programs: Overview of Canadian and U.S. Experience" (PDF). The Canadian Urban Transit Association. ^ "Ontario Specialized Transit Services Fact Book - 2015 Operating Data" (PDF). The Canadian Urban Transit Association. ^ "Shaping National Disability Policy: Transportation Access and Social Security Reforms". oac.cdlib.org. Archived from the original on 2017-12-14. Retrieved 2017-12-14. ^ "Chicago Tribune - Historical Newspapers". chicagotribune.com. Archived from the original on 29 April 2012. Retrieved 30 April 2018. ^ A Laundry list of challenges Archived 2014-04-26 at the Wayback Machine. Retrieved 2014-04-13. ^ Operators Squeezed by Lean Finances Archived 2014-04-06 at the Wayback Machine. Retrieved 2014-04-13. ^ Providers Strive to Balance Costs & Demand Archived 2012-12-24 at the Wayback Machine. Retrieved 2014-04-13. ^ Providers Tap Technology to Meet Increasing Demand Archived 2014-04-26 at the Wayback Machine. Retrieved 2014-04-13. ^ Technology Helps Paratransit Services Go Lean Archived 2013-07-22 at the Wayback Machine. Retrieved 2014-04-13. ^ Paratransit Providers Cite Ever-Higher Demand Archived 2014-04-26 at the Wayback Machine. Retrieved 2014-04-13. ^ Customer Service a Growing Concern for Operators Archived 2014-04-26 at the Wayback Machine. Retrieved 2014-04-13. ^ Operators Continue to Grapple with Funding, Demand, Retention Archived 2014-04-26 at the Wayback Machine. Retrieved 2014-04-13. ^ "Review of MetroAccess Ridership, Costs and Policy" (PDF). WMATA Finance Committee Report. June 11, 2009. Archived (PDF) from the original on February 1, 2010. Retrieved 2010-02-12. ^ WMATA’s MetroAccess Service, Washington, D.C.: Demand Response Traveler Information Archived 2014-04-26 at the Wayback Machine. Retrieved 2014-04-13. ^ "Paratransit Eligibility Code of Practice for Canada". 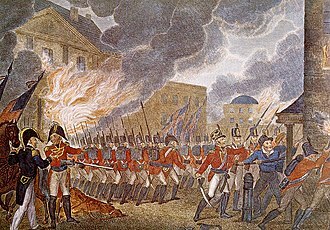 nelsonnygaard.com. Archived from the original on 5 February 2017. Retrieved 30 April 2018. ^ Cervero, Robert (2000). Informal Transport in the Developing World. Nairobi: United Nations Centre for Human Settlements (HABITAT). ISBN 9211314534. Auckland is a city in the North Island of New Zealand. It is the most populous area in the country. Auckland has a population of 1,495,000, which constitutes 32 percent of New Zealands population, a diverse and multicultural city, Auckland is home to the largest Polynesian population in the world. It has been called Ākarana, the Māori pronunciation of Auckland, the Auckland urban area ranges to Waiwera in the north, Kumeu in the northwest, and Runciman in the south. It is not contiguous, the section from Waiwera to Whangaparāoa Peninsula is separate from its nearest neighbouring suburb of Long Bay, the surrounding hills are covered in rainforest and the landscape is dotted with dozens of dormant volcanic cones. 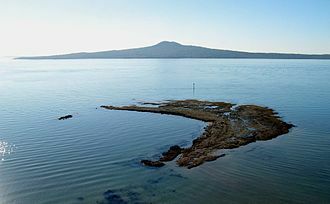 The central part of the area occupies a narrow isthmus between the Manukau Harbour on the Tasman Sea and the Waitemata Harbour on the Pacific Ocean. 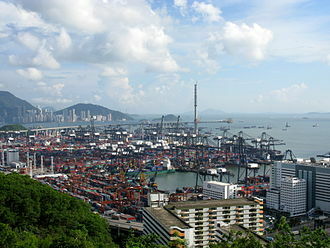 It is one of the few cities in the world to have harbours on two major bodies of water. 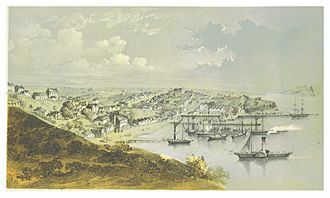 The isthmus on which Auckland resides was first settled around 1350 and was valued for its rich, Māori population in the area is estimated to have peaked at 20,000 before the arrival of Europeans. 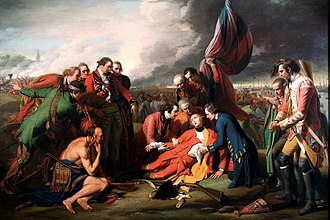 After a British colony was established in 1840, the new Governor of New Zealand, William Hobson and he named the area Auckland for George Eden, Earl of Auckland, British First Lord of the Admiralty. 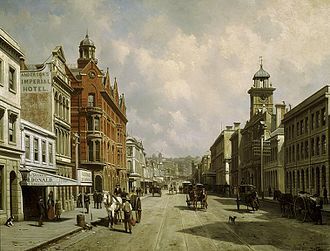 It was replaced as the capital in 1865, but immigration to the new city stayed strong, Aucklands Central Business District is the major financial centre of New Zealand. Auckland is classified as a Beta World City because of its importance in finance, media, arts and tourism. Aucklands landmarks such as the Auckland Art Gallery Toi o Tāmaki, the Harbour Bridge, the Sky Tower, the isthmus was settled by Māori around 1350, and was valued for its rich and fertile land. Many pā were created, mainly on the volcanic peaks, Māori population in the area is estimated to have been about 20,000 people before the arrival of Europeans. 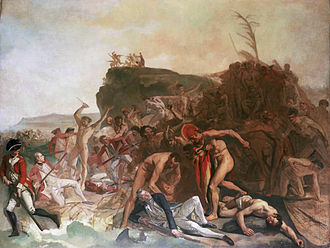 As a result, the region had relatively low numbers of Māori when European settlement of New Zealand began, there is, nothing to suggest that this was the result of a deliberate European policy. Baby boomers are the demographic group born during the post–World War II baby boom, approximately between the years 1946 and 1964. This includes people who are between 53 and 71 years old in 2017, according to the U. S. Census Bureau. 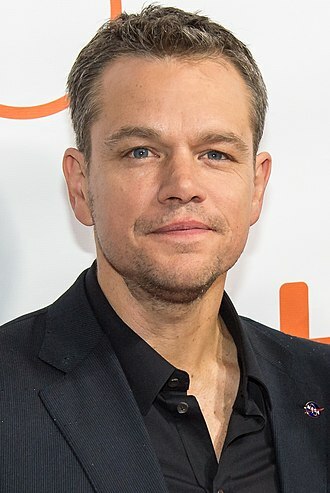 However, according to the Strauss–Howe generational theory, baby boomers are defined as people born between 1943 and 1960, which would include people who are between 57 and 74 years old in 2017. The term baby boomer is used in a cultural context, different people and scholars have varying opinions on who is a baby boomer, both technically and culturally. Baby boomers are associated with a rejection or redefinition of traditional values, many commentators, have disputed the extent of that rejection, noting the widespread continuity of values with older and younger generations. In Europe and North America, boomers are associated with privilege, as many grew up in a time of widespread government subsidies in post-war housing and education. The increased consumerism for this generation has been criticized as excessive. One feature of the boomers was that they have tended to think of themselves as a special generation, very different from those that had come before. This rhetoric had an important impact in the perceptions of the boomers, as well as their tendency to define the world in terms of generations. The baby boom has been described variously as a shockwave and as the pig in the python, the term Generation Jones is sometimes used to describe those born between 1954 and 1965. The term is used to refer to the half of the Baby boomer cohort. The phrase baby boom refers to a increase in the birth rate. According to the Oxford English Dictionary, the first recorded use of baby boomer is from 1970 in an article in The Washington Post, various authors have delimited the baby boom period differently. The United States Census Bureau considers a baby boomer to be born during the demographic birth boom between 1946 and 1964. This group represents more than half of the generation, or roughly 38,002,000 people of all races. DMR, along with P25 phase II and NXDN are the main competitor technologies in achieving 6.25 kHz equivalent bandwidth using the proprietary AMBE+2 vocoder. DMR and P25 II both use two-slot TDMA in a 12.5 kHz channel, while NXDN uses discrete 6.25 kHz channels using frequency division, DMR was designed with three tiers. DMR tiers I and II were first published in 2005, and DMR III was published in 2012, the modulation is 4-state FSK, which creates four possible symbols over the air at a rate of 4,800 symbols/s, corresponding to 9,600 bit/s. The standards are still under development with revisions being made regularly as more systems are deployed, DMR covers the RF range 30 MHz to 1 GHz. 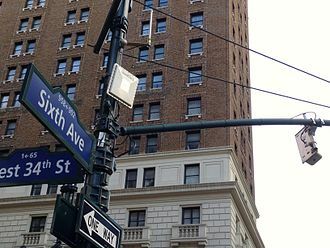 There are DMR implementations, that operate as low as 66 MHz The DMR Association, forward error correction can achieve a higher quality of voice when the receive signal is still relatively high. At a higher quality of voice, DMR outperforms analogue FM by about 11 dB, but at a lower quality of voice, analogue FM outperforms DMR by about 5 dB. Where digital signal processing is used to enhance analog FM audio, however DSP processing of analog FM audio does not remove the 12.5 kHz requirement so DMR is still more spectrally efficient. DMR Tier I products are for use in the European 446 MHz band. In the US, the 446 MHz range is primary US Government with the radio service a heavy secondary user. Some DMR radios that make it across the ocean have caused issues with licensed amateur operations. ETSI DMR specifies two slot TDMA in 12.5 kHz channels for Tier I, II and III and this part of the standard provides for consumer applications and low-power commercial applications, using a maximum of 0.5 watt RF power. DMR Tier II covers licensed conventional radio systems and hand portables operating in PMR frequency bands from 66–960 MHz. The ETSI DMR Tier II standard is targeted at users who need spectral efficiency, advanced voice features. A number of manufacturers have DMR Tier II compliant products on the market, DMR Tier III covers trunking operation in frequency bands 66–960 MHz. The Americans with Disabilities Act of 1990 is a US labor law that prohibits unjustified discrimination based on disability. 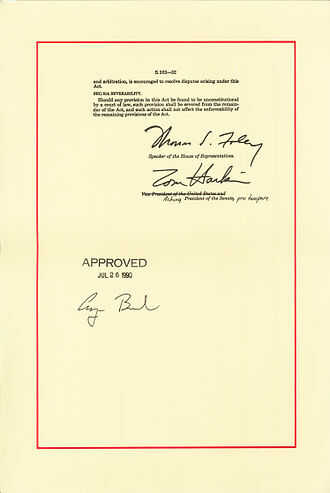 The final version of the bill was signed into law on July 26,1990 and it was amended in 2008 and signed by President George W. Bush with changes effective as of January 1,2009. ADA disabilities include both mental and physical medical conditions, a condition does not need to be severe or permanent to be a disability. Additionally, other conditions, such as gender identity disorders, are excluded under the definition of disability. 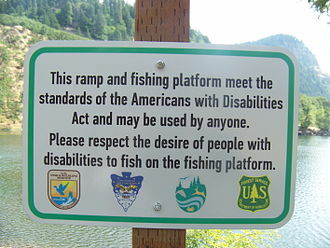 The ADA states that an entity shall not discriminate against a qualified individual with a disability. This applies to job application procedures, hiring and discharge of employees, job training, and other terms, covered entities include employers with 15 or more employees, as well as employment agencies, labor organizations, and joint labor-management committees. Prohibited discrimination may include, among other things, firing or refusing to hire someone based on a real or perceived disability, covered entities are required to provide reasonable accommodations to job applicants and employees with disabilities. An employee or applicant who currently engages in the use of drugs is not considered qualified when a covered entity takes adverse action based on such use. There are many ways to discriminate against people based on disabilities, anyone known to have a history of mental disorders can be considered disabled. Employers with more than 15 employees must take care to all employees fairly. Even when an employee is doing a job well, she or he is not necessarily no longer disabled. The Court determined that state employees cannot sue their employer for violating ADA rules, state employees can, file complaints at the Department of Justice or the Equal Employment Opportunity Commission, who can sue on their behalf. Title II prohibits disability discrimination by all entities at the local level, e. g. school district, city, or county. Public entities must comply with Title II regulations by the U. S. Department of Justice and these regulations cover access to all programs and services offered by the entity. Wheel-Trans is a specialized accessible transit service in Toronto, Canada, provided by the Toronto Transit Commission. It involves door-to-door accessible transit service for persons with physical disabilities using its fleet of accessible minibuses or contracted accessible taxis, users must register with the TTC who will typically grant access to those with permanent disabilities or show difficulty in traveling short distances. Wheel-Trans only provides service within the City of Toronto and accepts regular TTC fare, the para-transit system was created in 1975 as a two-year pilot project contracted to Wheelchair Mobile and operated on behalf of Metropolitan Toronto and the province of Ontario until 1976. Only individuals using wheelchairs were accepted as the original 46 users of the pilot project, in 1977 the service was contracted to All-Way Transportation Corporation of Toronto before being taken over by the TTC in 1985. Service is provided by buses and contracted accessible taxi mini-vans. The Government Accountability Office is a government agency that provides auditing and investigative services for the United States Congress. It is the audit institution of the federal government of the United States. The GAO was established as the General Accounting Office by the Budget and Accounting Act of 1921. reports recommendations looking to greater economy or efficiency in public expenditures. The name was changed in 2004 to Government Accountability Office by the GAO Human Capital Reform Act to better reflect the mission of the office, while most other countries have government entities similar to the GAO, their focus is primarily on conducting financial audits. The GAOs auditors conduct not only financial audits, but engage in an assortment of performance audits. News media often draw attention to the GAOs work by publishing stories on the findings, members of Congress frequently cite the GAOs work in statements to the press, congressional hearings, and floor debates on proposed legislation. 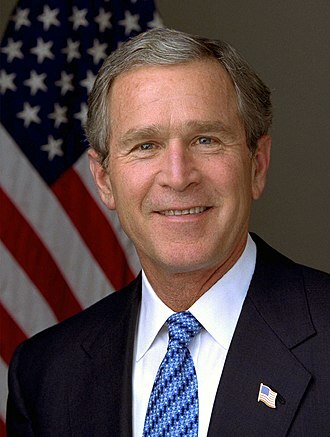 The GAO is headed by the general of the U. S. a professional. The comptroller general is appointed by the president, by and with the advice and consent of the Senate, for a 15-year, the president selects a nominee from a list of at least three individuals recommended by an eight-member bipartisan, bicameral commission of congressional leaders. During such term, the general has standing to pursue litigation to compel access to federal agency information. 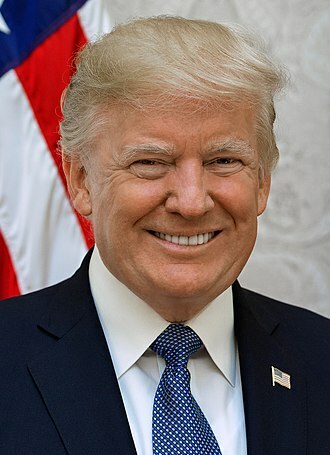 The comptroller general may not be removed by the president, since 1921, there have been only seven comptrollers general, and no formal attempt has ever been made to remove a comptroller general. Labor-management relations became fractious during the 9-year tenure of the 7th comptroller general, on September 19,2007, GAO analysts voted by a margin of two to one, in a 75% turnout, to establish the first union in the GAOs 86-year history. The analysts voted to affiliate with the International Federation of Professional and Technical Engineers, there are more than 1,800 analysts in the GAO analysts bargaining unit, the local voted to name itself IFPTE Local 1921, in honor of the date of the GAOs establishment. A minibus, microbus, or minicoach is a passenger carrying motor vehicle that is designed to carry more people than a multi-purpose vehicle or minivan, but fewer people than a full-size bus. In the United Kingdom, the minibus is used to describe any full-sized passenger carrying van. Minibuses have a capacity of between 8 and 30 seats. Larger minibuses may be called midibuses, minibuses are typically front-engined step-entrance vehicles, although low floor minibuses do exist. Minibuses are used for a variety of reasons, in a public transport role, they can be used as fixed route transit buses, airport buses, flexible demand responsive transport vehicles, share taxis or large taxicabs. Accessible minibuses can be used for paratransit services, by local authorities, transit operators. Private uses of minibuses can include corporate transport, charter buses, sports clubs, community groups and charities may use minibuses for private transport. Individual owners may use reduced seating minibuses as cheap recreational vehicles, by size, microbuses are minibuses smaller than 8 metres long. Midibuses are minibuses bigger than microbuses but smaller than plenibuses, there are many different types and configurations of minibuses, due to historical and local differences, and usage. Minibus designs can be classified in three groups, with a general increase in seating capacity with each type, Van conversions. Simple, optional extras Body builds Purpose built The most basic source of minibus is the van conversion, Van conversions involve adding windows to the bodywork, and seating to the cargo area. Van conversion minibuses outwardly look the same shape as the parent van, access to the former cargo area for passengers is through the standard van side sliding door, or the rear doors. These may be fitted with equipment to make boarding easier. Optional extras to van converted minibuses can include the addition of a rollsign for transit work, for public transport use, this door may be an automatic concertina type. For other uses, this may be a simple plug style coach door, depending on the relevant legislation, conversions may involve wheelchair lifts and tachograph equipment. A van conversion with an area in the front and a storage area in the back. 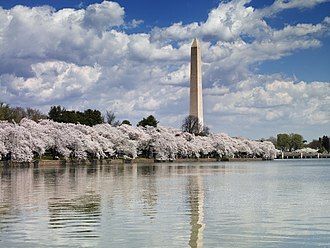 The Urban Institute is a Washington DC-based think tank that carries out economic and social policy research to open minds, shape decisions, and offer solutions. The institute receives funding from government contracts and private donors, the Urban Institutue is described as a leading liberal think tank by the Los Angeles Times. Johnson hand-selected well-known economists and civic leaders to create the non-partisan and their ranks included Kermit Gordon, McGeorge Bundy, Irwin Miller, Arjay Miller, Richard Neustadt, Cyrus Vance, and Robert McNamara. William Gorham, former Assistant Secretary for Health and Welfare, was selected as its first president, Urbans research and funding base broadened. 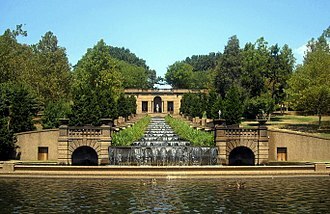 Some of Urbans more than 100 private sponsors and funders include the Annie E, casey Foundation, the Ford Foundation, the Robert Wood Johnson Foundation, the Henry J. Kaiser Family Foundation, the Charles Stewart Mott Foundation, and the Rockefeller Foundation. At any given time 200 or more projects are underway at the Institute, the Institute studies the family and societal issues faced by prisoners released from prison. Overseas, UI has had projects in 20 countries, providing assistance in decentralization, local governance. Many Urban Institute policy centers are recognized as the leading institutes in their fields. 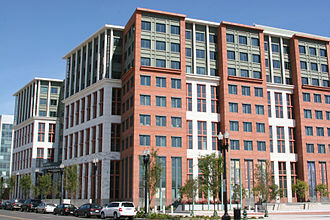 The Institute houses the Urban Institute -Brookings Institution Tax Policy Center, in 2010, the Institute conducted research related to all 50 states and roughly 25 countries. Sarah Rosen Wartell, a public policy executive and housing markets expert and she succeeded Robert D. Reischauer, former head of the Congressional Budget Office. Reischauer succeeded William Gorham, founding president, in 2000, most Urban Institute researchers are economists, social scientists, or public policy and administration researchers. 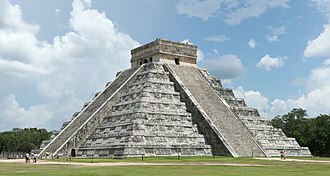 Others are mathematicians, city planners, engineers, or computer scientists, a few have backgrounds in medicine, law, or arts and letters. Unique among the nations largest research organizations, the Institute is 63% female, as of mid-2011, 27% of the Institutes staff is minority. Rales, Anthony A.
Transdev, formerly Veolia Transdev, is a French-based international private public transport operator with operations in 19 countries. The group was formed by the merger of Veolia Transport and Transdev on 3 April 2011, Veolia Environnement and Caisse des Dépôts et Consignations had 50% shareholdings. It was initially planned for the company to be sold by a public offering, potentially accompanied by a rebranding. In early 2012 it was reported that Cube Infrastructure, a controlled by the French bank Natixis, was likely to acquire about half of Veolias stake in Transdev. The Caisse des Dépôts would take over the other half and this was not implemented, but instead, Caisse des Dépôts acquired 10% of the shares from Veolia in October 2012. Following the sale of Transdev subsidiary SNCM in late 2015, CDC, in 2013 CEO Jérôme Gallot confirmed Veolia Transdev would consolidate its operations down to 17 countries. Transdev owned 66% of SNCM, a French ferry company operating in the Mediterranean, however, as of 2014, Transdev was planning to sell its shares. SNCM was finally sold to a Corsican firm Rocca Group in late 2015 and was renamed Maritima Ferries in January 2016, thello operates trains between Italy and France, Transdev relinquishes its 33% holding in 2016. In July 2015, Transdev commenced operating 17 coach routes under the Isilines brand to coincide with the deregulation of the French coach market, Transdev Netherlands is made up of three operations, Veolia Transport Nederland and Witte Kruis. It was set up in December 2015 to group the three together under one brand, after bringing Connexxion and Veolia Transport Nederland under one management earlier in May that year. Each operation continues to exist separately with its branding unchanged and this arrangement was planned ever since the global rebranding of Veolia Transdev in 2013. Connexxion is owned by Transdev-BNG-Connexxion Holding BV, a consortium between Transdev, BNG Bank and Connexxion Holding N. V, the consortium used to own 66. 7% of shares until they bought the remaining 33. 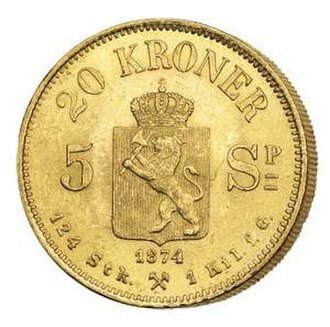 3% of shares from the Dutch state in February 2013. Veolia Transport Nederland operates bus and ferry services around Netherlands since 1997, Witte Kruis is Transdevs mobile care organization in Netherlands. In Belgium, Veolia Transdevs operations were known as Veolia Transport Belgium, VTB was sold to a consortium consisting of Cube Infrastructure and Gimv in March 2014. Transdev North America, formerly Veolia Transportation until August/September 2014, is the North American business unit of Transdev and it operates a number of public transport services across the United States and Canada. Transdev North Americas operations can be split into four divisions, Rail, On-Demand, other North American operations inherited from the old Transdev were never part of Veolia Transportation and therefore are not part of Transdev North America. It was inherited from the old Transdev and hence is not part of Transdev North America operations, Transdev North America US operations include, Colorado, Regional Transportation District routes throughout the metro-wide District. 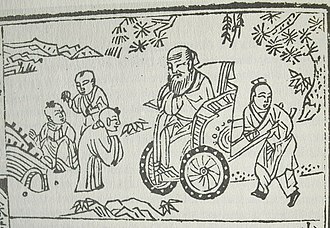 Depiction of Chinese philosopher Confucius in a wheelchair, dating to ca. 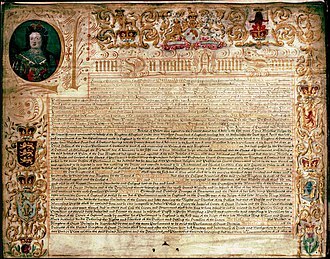 1680. 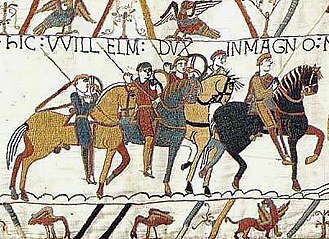 The artist may have been thinking of methods of transport common in his own day. 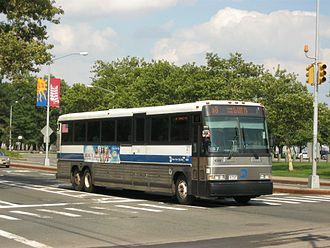 The New York City Transit Authority (trading as MTA New York City Transit) provides bus, subway, and paratransit service throughout New York City. The original livery for NYC Transit Authority buses in the 1950s. The MBTA provides services in five different modes (boat not pictured) around Greater Boston. Park Street Station Red Line southbound side platform with Daktronics electronic countdown sign. After years of delays, the first countdown signs on the Red Line were activated in 2012. 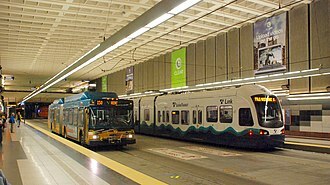 A King County Metro coach operating on Route 41, at University Street station in the Downtown Seattle Transit Tunnel. Saw cut loop detectors for vehicle detection buried in the pavement at this intersection as seen by the rectangular shapes of loop detector sealant at the bottom part of this picture. 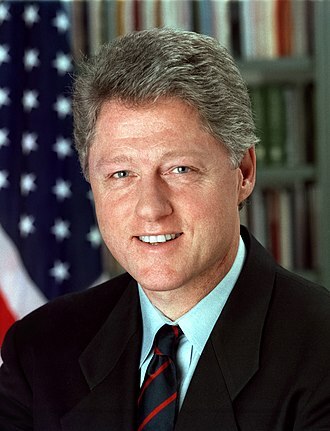 Three American Presidents were born in 1946: Bill Clinton (42nd), George W. Bush (43rd), and Donald Trump (45th). A Metrorail Breda 3000-Series car on Blue Line route in October 2005. A newer dial-a-ride low floor minbus. A portable radio compatible with the DMR Tier III digital radio standard.